Posted on Thu, Mar 29, 2012 : 8:15 a.m.
Gotye plays a sold-out show at Pease Auditorium on Monday. Gotye, the Australian pop sensation whose breakup-themed single, “Somebody That I Used To Know,” has enjoyed more than 100 million YouTube hits thanks partly to its eye-catching, stop-frame, body-painting video, brings his music to Eastern Michigan University’s Pease Auditorium Monday night. 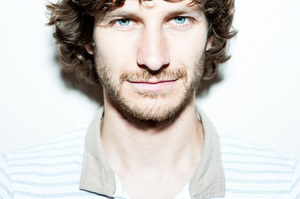 “It’s sometimes exciting, mostly confusing,” said Gotye (pronounced Gauthier) of his near-meteoric rise to the top. It’s a bit absurd sometimes when I think about it," he added in a recent phone interview. Annarbor.com caught up with Gotye by phone recently as he was sightseeing in Washington D.C., just before his U.S. tour was set to begin. Although he is performing at EMU, accompanied by vocalist-collaborator Kimbra, Gotye’s show is presented by the Blind Pig. Despite the success of “Somebody That I Used To Know,” Gotye said he didn’t set out to write a commercial pop song. “I’ve always tried to find some strange balance between my love of very catchy pop music and things that are a bit more idiosyncratic, and kind of try to push some the strictures of pop arrangement and sound choices and production. I’ve never been interested in trying to make music that sounds like what pop sounds like now,” he said. Gotye, given name Wouter "Wally" De Backer, has often been compared to Sting and Peter Gabriel, thanks to the register in which he sings, but such comparisons tend merely to be an easy way to categorize his sound, he noted. Who: Belgian-Australian multi-instrumental musician / singer-songwriter. With New Zealand singer-collaborator Kimbra. The show is presented by the Blind Pig. Where: Pease Auditorium, Eastern Michigan University. When: 7 p.m. (doors) Monday, April 2. How much: SOLD OUT. Info: www.blindpigmusic.com. "The Sting one—I love The Police—but I think it’s a bit of a cheap connection,” said Gotye. “I sing in a high, sometimes forceful tenor, which is just kind of an obvious reference point maybe. The Peter Gabriel thing, I find that flattering as well—I really love Peter Gabriel’s records. But I think there are more interesting left-of-center things you could say are even more direct influences on what comes out in my music. People just don’t tend to mention them. It's flattering on the one hand, but on the other hand it's not flattering when they just compare you to other vocalists." Although he may seem like an overnight sensation, and maybe on these shores he is, Gotye first found fame in Australia with his second album, 2006’s “Like Drawing Blood,” which has since been voted the 11th greatest Australian album of all time. The current follow-up, “Making Mirrors,” was more than two and a half years in production, with much of the writing and recording done in a barn on his parents’ remote property, where he said the isolation allowed for plenty of sonic experimentation. In interviews, he’s spoken of his fondness for his Lowrey Cotillion (a vintage organ) or the Winton Musical Fence, an instrument he discovered in the Outback consisting of five large metal strings attached to wooden fence posts and a resonant chamber. He’s also mentioned the horn break from a traditional Taiwanese folk song he discovered on a 1970s Cathay Pacific promotional record, which he sampled, sped up and dubbed out, before introducing it to some Turkish drum sounds. If the uptempo track “I Feel Better” has the feel of a 1960s Motown hit, that’s by design as well, he said. Given the time it took to lay down “Making Mirrors,” don’t expect Gotye to rush out a follow-up disc just to capitalize on his success. “I usually like to get to the end of the hustle-and-bustle period of releasing a record and promoting it and touring before I think I can kind of withdraw and find the direction and experiment and sort of know where I’m going,” he said. “I’m not at the moment feeling like I need to rush into making new material, although I am very keen to get writing and producing again. I think I’ll just naturally wait for a moment that I can withdraw into another studio space and think up a different process and technique to try and make a different-sounding record thank what I’ve done before (and) see if that takes me somewhere interesting.